March 20, 2019 - The digital marketer's #1 daily briefing! Facebook is removing basic targeting options for some sensitive ads. 114-point checklist to audit your digital activities. Bing is attracting PPC professionals on its platform. Snapchat has a gaming vision, but Facebook has a much bigger vision for the future. How smart do you feel? There’s a hotel where you can pay with knowledge. If you are committed to building and growing a business, you’ll already know that there are a huge number of tasks and action items to be completed on a day to day basis. With so much information, tools and strategies out there, it actually gets tougher to prioritize where you’re focusing your time, energy, and resources. To help you out with this, Daniel Doan shared a comprehensive digital marketing gap analysis and audit checklist. Not only does it provide you with a template to organize and prioritize your focus areas, but it’s also designed to give you valuable recommendations on the latest major digital marketing trends. This 114-point checklist will guide you to a better understanding of your audience and help you generate large amounts of qualified organic traffic on autopilot. Well, depending on the number of recommendations that you actually implement. The spreadsheet contains the category of tasks to focus on, recommendations for each category and allows you to prioritize and keep track of all tasks. Download the spreadsheet and start implementing the ones most relevant for your business. 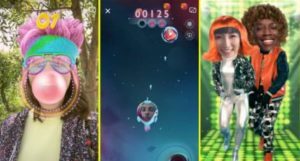 Snapchat announced the launch of Snappables – Augmented reality (AR) games that use your touch, motion and facial expressions to compete for high scores or in literal head-to-head multiplayer match-ups. It’s clear that Snapchat want to make their AR lenses stand out from the crowd, rather than just using them to dress up for a selfie. These new lenses will be rolled out globally this week and new games for these lenses will be released every week. Some of the initial game releases are space shooters, a bubble gum popping contest, a weight lifting game you play by straining your forehead, a kiss-blowing game, an egg catching competition and a dance party. Here’s a demo version of a game to give you a better idea of what to expect. To play Snappables, just select one of the game lenses from the Snapchat camera and follow the instructions. You can play them solo or you can invite your friends to play along. You can also send a Snap of the game you are playing, which they can use to jump in and play too. Snappables will be it’s first ever collaborative lenses that let you interact with another friend on their own phone, and it could create fresh new avenues for the app in the future. Snapchat has previously used selfie-games for brands like Kraft, Gatorade, which were an instant hit among their audiences, so it makes sense that they are bringing this feature to the forefront. Snapchat’s idea behind these selfie-games is to reach out to audiences who are looking for more than just texting and showing off on social platforms. By making people feel like they’re together even when they’re apart, it could help them strengthen their growth after years of battling Instagram for users. Games could help achieve that feeling of co-presence. Although, Instagram might not be far behind in offering games inside Stories. When Facebook goes down, it takes down a whole social ecosystem with it and has a knock-on effect on countless businesses and people. Let’s see just how badly it affected the businesses involved. In other news, targeting restrictions for housing, employment and credit ads and Facebook’s plans to take social interaction to the next level. We are talking about last week’s Facebook outage. We already know that a whole economy is linked to Facebook – Countless businesses use Facebook and Instagram to grow and drive sales. Thus, whenever Facebook goes down, these businesses go down with it. While we might sometimes poke fun at the issue, it’s important to remember that there are real people out there losing very real money every time FB goes down. Chances are that you’re among those people too. Even if you’re only small advertiser, the damages can be devastating to your bottom line. Jason Wong, for instance, lost $10K on March 13. That was the day he planned to restock his false eyelash line. Unfortunately, he picked the wrong day to run FB and Instagram campaigns and to have influencers promote his products. Even brands that don’t sell directly on FB have been affected: Laura Faint, head of performance marketing at product design studio AJ&Smart, said that the company saw a 4 to 6 percent decline in clicks and engagement. Simply put, their brand was visible to fewer people on that day and this impacted sales. The blackout hit the businesses trying to promote an event on that day even harder. Candy Calderon, a holistic health and wellness coach, planned to hold online training for women entrepreneurs the day after the outage. She had intended to purchase last-minute ads on Facebook, Instagram, and Instagram Stories to promote her event. But the ads never ran, of course. Therefore, Calderon missed out on many potential enrollments for her course. Many influencers were affected by the outage too. However, while dealing with brands, they often include a clause about a “force majeure,” or an unforeseen circumstance, such as the social platforms going down. This allows brands and influencers to reschedule the post. While the money might not be lost, these are still lost chances. So, these are just some of the scenarios from the last week’s Facebook issue. Many thousands of others will also have been hit where it hurts. Maybe you were one of them? If so, let us know about your story. Given that countless firms count on FB to drive sales, and that Facebook counts on these businesses to drive their ad revenues, Facebook really should be more open about what is happening on their backend when it comes to these outages. What can you do about it though? Well, you should have other traffic sources to reach out to your customers. Being dependent on just one platform, even though it’s huge, is never the wisest decision. Put your eggs in other baskets. Do you run housing, employment and credit ads on FB? If so, you might not be very happy with this update. In order to protect people from discrimination on its platform, Facebook is making some changes to the above ad categories. The changes came due to some pressure from civil rights organizations such as the National Fair Housing Alliance and the American Civil Liberties Union. If you want to run housing, employment or credit ads, you will no longer be allowed to target by age, gender or zip code. Advertisers offering housing, employment and credit opportunities will have a much smaller set of targeting categories available for their campaigns. Any detailed targeting option describing or appearing to relate to protected classes will also be unavailable. FB is building a tool which will let you search for and view all current housing ads in the US targeted to different places across the country. FB says that housing, employment and credit ads are crucial to helping people buy new homes, start great careers and gain access to credit. They’re important, so they shouldn’t be used to discriminate. If you’re into real estate, run financial lead gen ads or run some employment offers, this update might affect you. There is a long history of discrimination in verticals related to housing, employment and credit. Facebook is trying to avoid this very grey area of controversy on its platform. Age and gender are two useful targeting options used to set up and optimize campaigns. The importance is different for every campaign, but they are basic targeting options that can be helpful to optimize. But Facebook just wants to stay away from these kind of issues. Our suggestion is the same as the previous post: Don’t put all your eggs in one basket. So far, FB has helped us to connect and share with people in our lives, no matter where they live. But FB has goals that go far beyond that. They’re creating a better way for people to connect with each other. And no, this is not about that “privacy-focused” platform Mark talked about recently. They’re working on a project called Codec Avatar, which seeks to overcome the challenges of physical distance between people. Using 3D capture technology and AI systems, Codec Avatar aims to allow people to create lifelike virtual avatars of themselves quickly and easily. The goal with this project is to make social connections in virtual reality as natural and as common as in the real world. Codec Avatar is just an active research project for now, but it could totally change the way we interact with each other in the future. Staying ahead of the game, while the researchers are still seeking the best way to turn this ambition into reality, Mark Zuckerberg is already thinking about how they can monetize it! Cheers! To an avatar life full of virtual ads! Bing Ads Editor (BAE) has released some updates to make Google Ads imports faster and easier. They really are trying everything they can to make PPC professionals include Bing Ads in their marketing mix. The import and scheduling options are now more consistent with Google Ads import options in the web UI. You can now set bids, budgets and landing page URLs specifically for Bing Ads during the import process. Using the “Advanced Options” dropdown, you can also check off the campaign aspects you want to import. You can now import Google Ads campaigns directly to the Bing Ads server. Rather than uploading them to your local machine first and then uploading them to Bing’s server. Although if you want to make any changes to the campaigns, it is still recommended to go with the manual upload. If you have been looking to move some part of your marketing budget to Bing ads, now is the time to get started. With these time-saving updates, it is now much easier to get your campaigns up and running on Bing Ads. Over the last 2 years, Google has been playing around with the ad labels that show next to the text ads on search. Now, it seems that Google is testing them again. Previously it played around with green text and borders. Now, it looks to be testing a simpler and more subtle ad label treatment. Darren Taylor was the first to spot these ad labels with bolded black text and no border. The label appears at the top of the ad along with the display URL. Interestingly, it was back in 2013 the Federal Trade Commission required search engines to label sponsored ads more clearly in search results. It suggested prominent shading, a prominent border, or both. After that, Google moved away from background shading and introduced an “Ad” label with a yellow background. With this new test, Google is moving the Ad label above the body of the ad. Is this them becoming more compliant or just a short-term test? Only time will tell. Want to go back in time and have a look at the decade-long history of Google’s ad labelling and shadowing? Here’s a visual compilation of that from SearchEngineLand. Do you consider yourself a smart person? How much brain-power do you have? 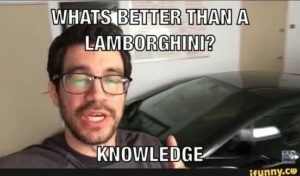 Why are we asking (if you’re that smart, you should already know, right? )Well, because if you’re intelligent enough, you qualify for a free stay in this hotel. Yes, in this Trivial Pursuit Hotel, the quality of your accommodation depends on answering their questions correctly. You can even get a 4-star experience for free. Even booking the hotel requires you to answer some Trivial Pursuit questions. If you feel like a real nerd, hurry up, because the hotel will be opened only during May 20 to June 14. This is obviously a marketing strategy by Hasbro to promote their board game: Trivial Pursuit. Well, it’s certainly worked, because we had no idea about this game before. Are you counting on your intelligence? ‘Cause, we are!